ClubCoins Needed: 288 Please note that this item is not available on your device. You may add the item to your Wish list and redeem from a compatible device. Built To Last, the defining management study of the nineties, showed how great companies triumph over time and how long-term sustained performance can be engineered into the DNA of an enterprise from the very beginning.But what about companies that are not born with great DNA? How can good companies, mediocre companies, even bad companies achieve enduring greatness? Are there those that convert lo… ng-term mediocrity or worse into long-term superiority? 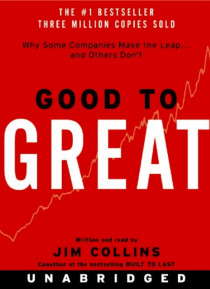 If so, what are the distinguishing characteristics that cause a company to go from good to great?Over five years, Jim Collins and his research team have analyzed the histories of 28 companies, discovering why some companies make the leap and others don't. The findings include:Level 5 Leadership: A surprising style, required for greatness.The Hedgehog Concept: Finding your three circles, to transcend the curse of competence.A Culture of Discipline: The alchemy of great results.Technology Accelerators: How good-to-great companies think differently about technology.The Flywheel and the Doom Loop: Why those who do frequent restructuring fail to make the leap.